Prairie Moon 4 is a steel sculpture with marble and copper insets. It is 7'-4" tall. It is constructed of mild steel and has a natural rust finish. This sculpture was selected for display in the "Sculpture on Second" exhibition in downtown Cedar Rapids, from August 2005 till June 2006. 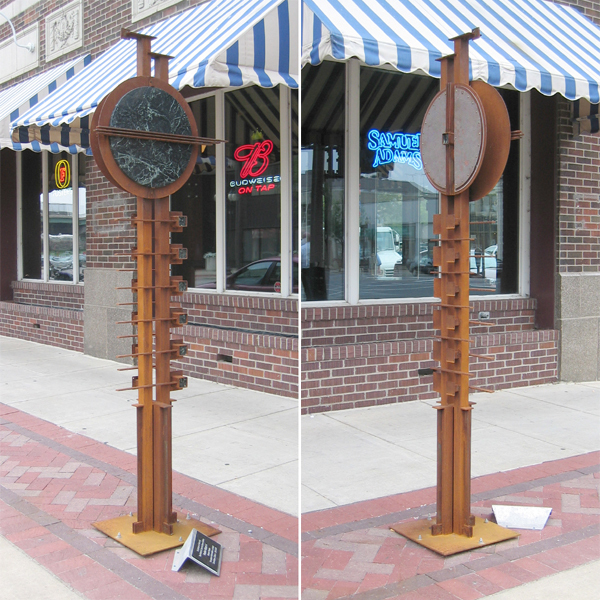 Also, it was recently on display in the "Sculpture on Second" exhibition in downtown Davenport. Yes, the two cities have the same name for their exhibitions. It is now for sale at the Corner House Gallery in Cedar Rapids.